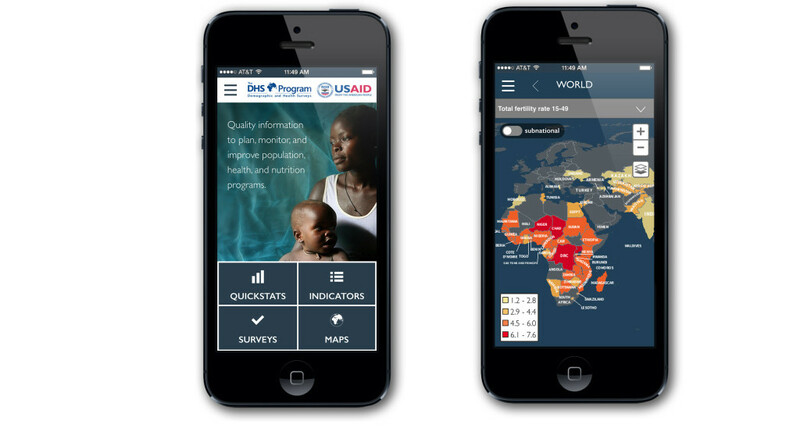 Blue Raster is excited to announce the release of the The DHS Program Mobile App v2.0. A more intuitive interface, offline data download feature and enhanced cartography are a few of the upgrades creating excitement around v2.0. Here’s a first look at what’s new in this release. Now when you use the app, you have access to 101 additional indicators — providing more than three times as much data than was previously accessible in v1.0. Behind the scenes, data is being supplied by the STATcompiler database through The DHS Program API. This ensures that you always have up-to-date data, even as new countries and indicators are added or adjusted. We updated the look and feel of the app to give you a more compelling, intuitive user experience. We also revamped the maps to feature the latest in cartographic design allowing for better interpretation and clarity. Get the app for your device today.